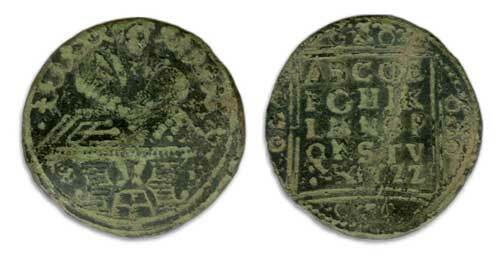 Throughout the later medieval and early post-medieval period, reckoning counters or jetons  the word is derived from the French, ‘jeter’, to cast or throw - played an important role in the world of commerce, and even in administration of the national economy. They were used for casting accounts at the Royal Exchequer, and by government officers and merchants for conducting their respective financial calculations. The word ‘exchequer’ means chessboard - a board divided into squares - and it was on tables or boards marked out in this manner that jetons were used to perform the calculations. Our ‘Chancellor of the Exchequer' is so-called because of the chequered counting board over which his predecessors once presided. The exact date of establishment of the Exchequer  a branch of the Treasury  is uncertain, but a royal writ referring to ‘barons of the exchequer’ provides evidence that it was in existence, and using a chequered table, well before 1118. From the Royal Exchequer, it is likely that the use of chequer-board accounting spread across the country and from government to commerce. This spread might initially have been via the county sheriffs, who had to present their accounts in person at the Royal Exchequer table, and may well have modelled their own local practices on it. 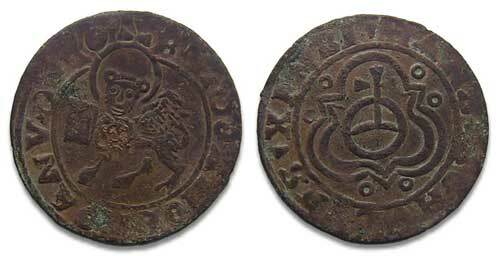 It would seem that in the early days, when chequer-board accounting was conducted mainly, if not exclusively, within the higher echelons of government, coins served as the main form of ‘counter’. 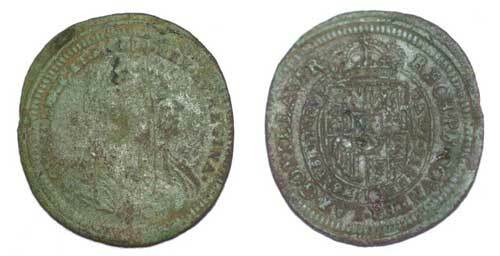 In fact, we know from contemporary sources that Venetian coins were used at the Royal Exchequer during the reign of John (1199-1216), and were still being used there during the reign of Edward II (1307-1327). The earliest known base-metal jetons used in England date circa 1280, and it seems likely that these filled a commercial need, as the use of the chequer board became more widespread. These early purpose-made jetons were produced in England, and were very similar in size and design to the contemporary Edwardian pennies. 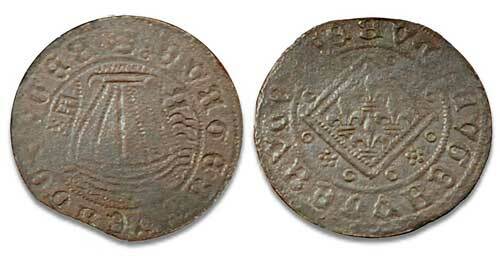 Many even carried a bust of the king from the same punches as were used to produce dies for the regal coinage. Being of brass, they were readily distinguishable from the silver coins, but to thwart those who might be tempted to plate them with tin or silver and pass them off as coins, they were pierced or indented at the centre. 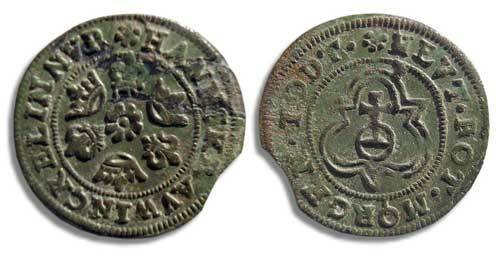 By the middle of the 14th century, English jetons were being produced at a larger size, typically of similar module to the groat, which circulated widely from the 1350’s. They are known as ‘wardrobe counters’ on account of an inscription on some of them (GARDE ROBE REGIS) making reference to the king’s Wardrobe, the department concerned with administering the finances of the king’s household. However, by the end of the century, competition from France effectively ended jeton production in England. Throughout the 15th century, France dominated the jeton market in this country, but its position was already being challenged before the century reached its end. Nuremberg had established itself as the prime supply-centre for cheap, mass-produced stock jetons, with which France was unable to compete. By the mid 16th century, the Nuremberg jeton-makers had effectively cornered the English market. It is with the Nuremberg makers and their jetons that the present article is mainly concerned. Its aim is to provide listings of the makers, the main types of jeton they produced, and the inscriptions that appear on them. Before doing so, however, it is worth taking a brief look at how calculations were performed on the chequer-board, and also at what happened to jeton production after this method of accounting became obsolete. Calculation using counters on a chequer board is analogous to that performed using beads on an abacus. The vertical columns are marked with values, such as £ (pounds), s (shillings) and d (pence), and the horizontal rows with transaction details. Counters representing the value of each transaction are placed in the applicable squares. To add the value of the transactions, all the counters are moved to the bottom row of their respective columns. For every twelve ‘penny’ counters that result, a single counter is added to the shillings square and twelve counters are removed from the penny square. The process is repeated for the ‘shilling’ counters, with each twenty resulting in a counter being added to the pound square and twenty removed from the shilling square. At the end of the process - which in the case of the Royal Exchequer would extend to columns representing many thousands of pounds - the calculation is complete. This might seem very laborious, but it should be borne in mind that the decimal system and Arabic numerals were not in use. Try performing paper calculations using Roman numerals to add £sd values! In fact, it was the adoption of Arabic numerals, and their inherent decimal basis (importantly recognising zero as a value), that rendered jetons, at least in their traditional role, redundant. The change to accounting by written calculation occurred during the course of the 17th century, and jetons produced since this time generally fall into one of three categories. At the low-value end, brass jetons were struck as gaming counters. The popularity of gaming houses had been increasing since the end of the 16th century, and the opportunity this presented was not lost on the jeton manufacturers. At the opposite extreme, silver jetons were struck as presentation pieces, which were often given as New Year gifts to government employees. Between these two extremes were the historical jetons or historical medalets, which commemorated significant events, or sometimes conveyed a political message. Although their popularity has decreased in recent times, jetons of all three categories were produced in considerable numbers until at least the end of the 19th century. The remainder of this article lists the Nuremberg guild masters, the types of jeton they struck, and the legends that are found on them. None of the lists is comprehensive, the aim being to give a general overview and to include details of those jetons that are most commonly recovered from the ground in England. For a comprehensive study, readers are referred to Michael Mitchiner’s work, referenced in the bibliography below. The masters are listed alphabetically in family groups, each of which is ordered chronologically, based on the first recorded date. It should be borne in mind that throughout most of the period under consideration, many anonymous jetons were struck. Some of these can be attributed to a known master on the basis of style, or by special marks used in the design; others remain unassigned. The list below covers the jetons that are most commonly found in this country. For each type, there are usually many minor design variations (varieties), and reverses and obverses are sometimes paired in ‘non-standard’ combinations. The most common type, by far, is the Rose / Orb jeton, which probably accounts for well over half the total number of Nuremberg jetons found. In addition to those listed, there are many allegorical and biblical jetons, but the legends and types are so variable that generalised descriptions are not possible. The obverse legend usually takes the form ‘Rechenmeister’s name in Nuremberg’, with the master’s name varying in spelling, and the place-name varying in both spelling and the extent of abbreviation. By way of example, the following are just a few of the forms used on the jetons attributed to Hans Krauwinckel II. The legends listed below are those that normally appear on the reverse of the jetons. It should be noted that the same basic legend is usually found in a variety of different forms. This arises as a result of spelling not being standardised at the time, and words being abbreviated in many different ways. Only one typical form of each legend is listed. Most of the legends are in German, but where this is not the case, the language is shown immediately after the translation. It should be noted that many jetons, particularly early ones, are inscribed with meaningless strings of letters, described as ‘fictitious legends’. Others have badly blundered legends, for which the intended rendering is barely recognisable. Occasionally, reversed ‘mirror-image’ legends are also found.